"The room was full of guns. Guns were mounted on all the walls. There were half a dozen guns at his feet... Rippling patterns of gunmetal, from floor to ceiling... There were guns in all the rooms." John Tallow is a New York police detective who's having a very bad week. He's discovered an apartment in a condemned building, filled with hundreds of guns - each used to commit a single murder. His disturbance of the trophies of the city's most prolific serial killer sets off a chain reaction. Now, powerful people are trying to silence him and the killer is stalking him. Tallow must race against the clock and dig into the history of the city to solve the crimes. 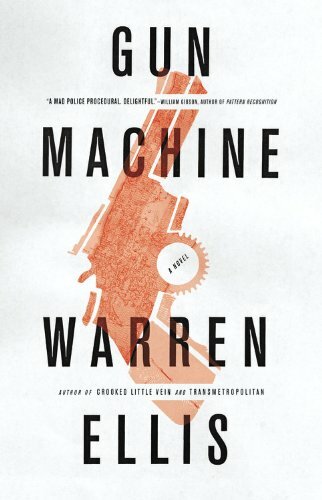 This is actually pretty sedate by Warren Ellis standards (check out his graphic novel series Transmetropolitan or Freak Angels or his other novel Crooked Little Vein for some truly bizarre and rather graphic science fiction). I love the way he weaves mythologies into the story, though. His characters banter and work together wonderfully. And you can't beat Warren Ellis for clever hangdog heroes like John Tallow.